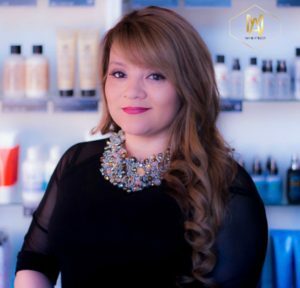 Mane Atelier Beauty Salon is owned and operated by Liz Contreras. Liz has a passion for hair because she knows you only get one first impression. Liz has worked in upscale salons for many years. Her career began in Grapevine, Texas and she currently works out of her top-rated hair extension salon, Mane Atelier Beauty Salon in Dallas, which is located in the Highland Park neighborhood. She holds several certifications which makes her more than qualified to turn your hair into exactly what you want. When you combine her professional training with her creative skills you get a hair stylist that thrives on providing only the best for her clients. Her passion has become her career. Liz enjoys being a hairstylist because she gets the opportunity to learn about her clients while bringing out their beauty. She enjoys extensions because you get instant gratification. Mane Atelier is where your hair dreams come true. With her passion for hair, Liz never stops learning. She strives to perfect her set of skills by continuing her education. She enjoys learning new things about everything from cuts, extensions, color, and more. It helps feed her love of being a hairstylist. Her experience, warm heart, and passion for hair make Liz the perfect candidate for professional hair care.